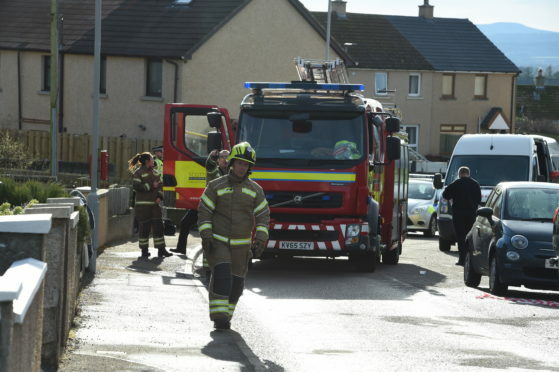 Firefighters at the scene in Lossiemouth. Picture by Jason Hedges. Neil Thompson, 35, was rushed to hospital in a serious condition along with his 31-year-old partner Natalie Mckay and 13-month-old daughter Hailey when the blaze broke out on Thursday, February 21. Up to 40 firefighters were mobilised to the seaside town after the alarm was raised at 3.45am with the fire badly damaging the home on MacDonald Drive. A neighbouring property was also evacuated as fire crews fought to bring it under control. The three occupants of the damaged property were initially taken to Dr Gray’s Hospital in Elgin and the toddler was then flown to hospital in Glasgow. Yesterday police confirmed Mr Thompson has died from the injuries he sustained in the blaze. Mike Mulholland, chairman of the Lossiemouth Community Council, said the whole of the town was thinking of his family. He said: “As a community we are devastated about this and the family have our thoughts and prayers at this time. “The whole community is very much behind them without question and we are all shocked and devastated. Heldon and Laich councillor James Allan knew the family well, as his sister went to school with Mr Thompson’s mother Beryl. He said: “It’s really sad news, my thoughts and prayers go out to the family. “I know them really well, as his mother Beryl works at Hythehill Primary so it is really sad to see. Local people have also taken to social media to pay tribute to Mr Thompson, who along with his brother inherited his father’s plumbing and heating business. Douglas Ross MP said: “I am so very sorry to hear this terrible news and express my sincere condolences to Neil’s family and friends. “It is particularly sad and tragic circumstances that have led to his death and my heart goes out to Neil’s partner, Natalie and the couple’s baby daughter.